Gunshots echoed and explosions rang out across Bama, the town in Borno State that had come under sporadic attacks from the Boko Haram in the last few months. But the echoes of the explosion this time were ominous. They were those of an occupation force intent on taking full control of the town. They shot the men and rounded up the women and children. Among them was Maryam Zanna, who was in her early 30s, and her little daughter. They had gone to braid their hair when the attackers came calling. The women were loaded onto trucks by their captors and driven away. And as Maryam looked back at the burning remains of her hometown, she thought her husband, Zanna Bukar Tombe and the little son she had left at home had been killed. 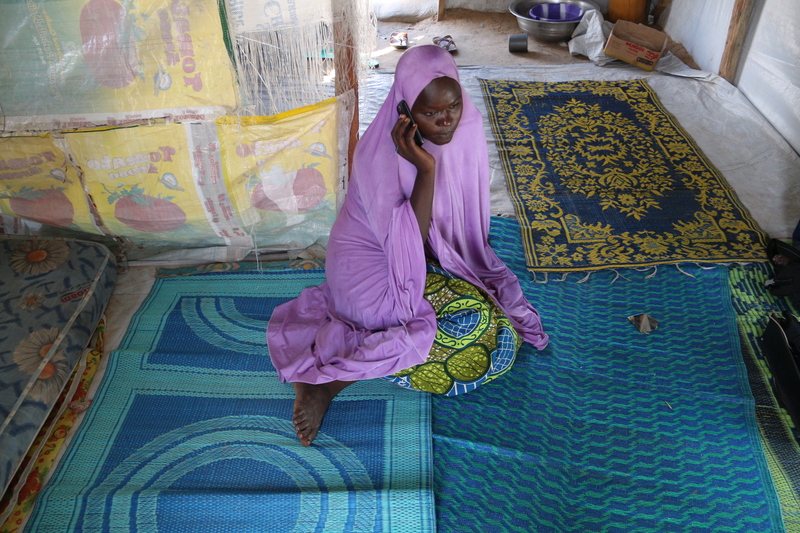 “I thought I would never see them again,” she said now in Kanuri, sitting on a plastic mat on the floor of her tarpaulin shelter in the Dalori Camp for displaced persons in the outskirts of Maiduguri. There wasn’t much in the room, just lots of colourful mats, a clothesline on which her clothes, her sons, and some blankets were hung. Behind her, there was a flimsy mattress pushed back against the tarpaulin wall. There was nothing comfortable here, but it must have been like heaven compared to what she went through when Boko Haram took her and the other women of Bama. They were driven to a village, split into groups and imprisoned in different houses. Maryam’s good fortune was that among the insurgents, there was one she knew, someone from their neighbourhood in Bama. He recognised her and ensured she was put in a select group of women that enjoyed some level of protection from abuse. Eventually, one of the militants set his eyes on Maryam and decided he wanted to take her as a wife. She told them she had a husband already. But deep down, she wasn’t sure her husband was alive. Whether he was or not would have mattered very little to her captors. Maryam’s case was helped by the familiar insurgent. “It was him who told them to leave me alone,” she said. And they did. For the six months she was in captivity, cooking food for them and being forced to attend sermons and preaching by Boko Haram commanders. But then one night, the familiar insurgent returned with some urgent news. He helped her with her daughter and two other women to scale the fence of their prison and set off on foot into the wild, running until they could run no longer. So they kept walking in the forest for hours. But dreams of escape were short lived. The escapees were soon rounded up by another group of Boko Haram insurgents on patrol and were taken to a different camp. There, she was put in another house and locked up alongside other women. About a month later, soldiers stormed the camp and freed them. The soldiers drove Maryam and the other women to her hometown, Bama, which at that time had just been recovered by the army and was practically in ruins. They were kept there for a month and questioned by the soldiers. After being screened, a process that took all of one month, Maryam and the other women and children were put into buses and transported to Maiduguri, some 72km away, to the Dalori Camp. 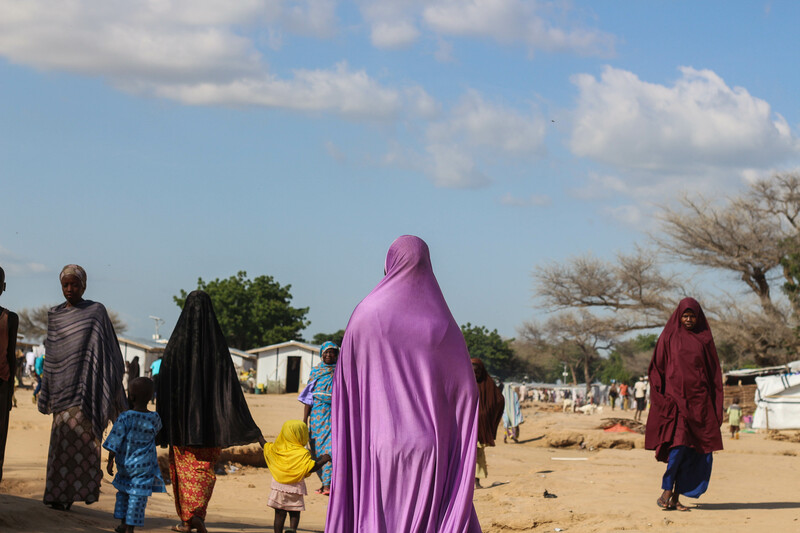 As the convoy made its way to the relative safety of Maiduguri, Maryam had no idea what to expect at the camp, but one thing she was sure of was that it would be better than where she had been the last seven months. As the vehicles arrived the gates of Dalori, Maryam peered out the window to catch glimpses of her new home, the faces that would become her neighbours. But there, among the men guarding the gate, she saw a familiar face, one she thought she would never see again. It was her husband, Zanna. “When I saw him, my mind was instantly at peace,” she said. She broke down and shed tears of joy as the vehicles drove into the camp. While he spoke, Zanna kept his head down, massaging his feet all the time. He was now a member of the Civilian Joint Task Force (JTF) and was part of the group that helps provide security at the Dalori camp. When Boko Haram attacked Bama, Zanna took his two-year-old son and fled. He was caught off by the insurgents and couldn’t go back for his wife and daughter as Boko Haram was shooting every man they set their eyes on. It was sad for him to leave Bama, where he had his family, where he had his own house and two cars he used to transport goods from Bama to Maiduguri, 72 km away. And this time, when he made this trip, it was to escape the Boko Haram rampage and deliver his life and that of his son to safety. For the first two months after the attack, he had no idea where his wife and daughter were. “I was anxious to see her, to hear news of her and my son because I didn’t know if they were dead or alive,” he said. Tired of idling away and feeling useless at the camp, he decided to join the Civilian JTF and contribute to the fight against Boko Haram. Patrolling the streets of Maiduguri and helping to secure the city felt far more useful than languishing in the camp. He didn’t hear any news of his wife and daughter until after two months, when one of his relatives who had been taken along with Maryam somehow managed to escape from Boko Haram and trekked 34 km to Konduga before she was brought toDalori. The news should have pleased him, but instead Zanna became more anxious. “When I heard she was alive I was worried because I thought that perhaps the way we were treating Boko Haram suspects here, tying them up and beating them up, was the way they were treating our own families they are holding,” he said. This fear impacted so deeply in Zanna that he worried in what state his wife would return, if she ever returned at all. 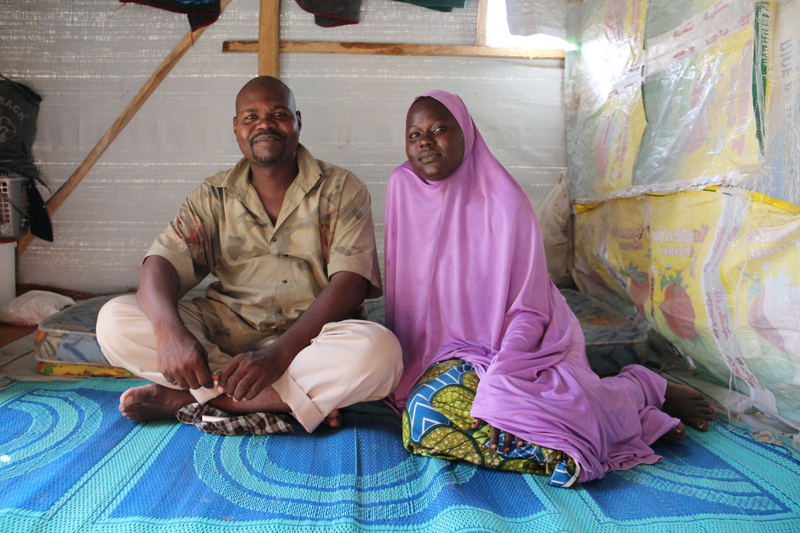 With no further news of his wife for months, and with a child who needed caring for, Zanna decided to marry a second wife, a fellow IDP at the camp. Plans for the wedding had advanced when one day, while on duty at the gate, Zanna caught glimpse of his wife Maryam being driven into the camp. With the excitement of the reunion over, reality slowly crept in on the couple. Maryam soon learnt that Zanna had plans to marry another wife. “I didn’t feel awkward that he was getting married because I wasn’t expecting to see him again,” she said, smiling bashfully. Maryam smiled a lot but when asked if she missed her husband while in captivity, she got really emotional and barely restrained herself from crying. When she spoke after that, her voice was softer, tremulous even. It was easy to see how much her husband meant to her. But the one time she didn’t hold back her tears was when after her return, Zanna had come to see her. “When she returned and I went to see her, she joked that she had heard I was going to get married. I laughed and said, well, it was because I had heard that a Boko Haram Ameer [leader] had married her. She broke down and started crying,” he said looking down at his feet as if he still remembered the anguish those words caused her. He had placated her then, telling her he only meant it as a joke. “I told her that I had only heard she was cooking for the bastards,” he said, almost apologetically. Maryam was eventually pacified, but they both knew that a really awkward wedge had been driven between them. Maryam hadn’t returned in the best of conditions and Zanna described how he had seen her then in sympathetic and affectionate tones. She had rashes all over her face, she was lean and her hair was browning because of poor diet. Much as he cared,Zanna was reluctant for their lives to resume as normal. He was simply finding it hard to take her back as his wife. He felt she had been tainted by the Boko Haram. The many women who had been abducted by the Boko Haram and managed to escape or were rescued have had to contend with the challenges of stigmatization. Some are rejected by their husbands who are reluctant to take them back. This is such a widespread problem that Non-Governmental organisations like Herwa Community Initiative in Maiduguri have taken it upon themselves to organise mediation sessions between the rescued people who they call “survivors” and they relatives or host communities. They use religious scholars and logic to persuade people to accept their relatives and neighbours who have been freed from the clutches of Boko Haram. They have succeeded with several cases, but they have also had failures as well. “There is a man, a religious scholar for that matter, who one would expect would encourage people to take back their wives, but this man swore he would never have anything to do with his wife who had been recovered from Boko Haram. We are still working on that case,” he said. William Ubimago, the Programme Officer of Herwa, is one of the officers at the forefront of the outreach programmes, providing counselling and skill acquisition training for the survivors. He was very passionate about the Zanna and Maryam case. “There are many things that people take into consideration, some are social, some feel it is a matter of pride and others feel that they can no longer take back women they think might have been used by Boko Haram, but they tend to forget that these people were forced at gunpoint and if they had been in a similar situation, they would have done the same,” he said. “When we bring people together and have mediated discussions with all parties involved, we are able to open channels of communications some of them have decided to block,” he added. That was not dissimilar to what transpired between Zanna and his wife Maryam. When Maryam was still in the den of her captors Zanna developed a closed mind. And when Maryam was recovered, even though he genuinely had sympathy for her, he said his fears kept him from taking her back. Even if she had been forcibly married to them, he insisted he would care for her. “There are women who are recovered and were impregnated by Boko Haram and we [Civilian JTF] have been bringing them back and giving them the attention they need. I would have taken care of her and the baby but there won’t be any intimacy between us,” he said. But fortunately, nothing like that happened with his wife. But when she told him she had not been married to her captors nor had she been violated by them, he was still sceptical. He was unconvinced and asked her to swear by the Qur’an. Zanna acknowledged the role of her uncle in the whole saga. He said the uncle who happened to be a religious scholar had spoken to him at length and convinced him of the folly of his belief. Finally convinced about his misguided stance, Zanna agreed to take back his wife. They went to a military clinic where they were both tested for HIV and other infections. With the results coming back negative, the road was clear for a proper reunion and renewal of marriage vows. “When he said he was going to take me back, I was happy because rarely do men take back their wives when they have been abducted by those people,” Maryam said, smiling. Zanna too was pleased with this development. “Her uncle told me since I was going to take her back, I should give her something valuable to show her that I really appreciated her and I was happy to take her back,” he said. So he handed her the things he had bought for the new wife he had planned to take. A year has passed since their reunion. Living in the dreariness of the camp and waiting for handouts from government and international and local agencies, the couple still glowed with happiness. It was evident in the way they looked at each other and smiled. In the affectionate tone they talked about each other. And in the regret in Zanna’s eyes when he spoke of how he thought of rejecting his wife. The only blemish to this story was the death of their first daughter, months after their rescue from the Boko Haram. The little girl died of measles. It was something that Maryam thinks about a lot. But regarding her ordeal in the hands of her captors, she was eager to put that behind her. Thank you for telling this story, Abubakar. Beautiful and touching. Nice one. But Boko Haram insurgency didn’t start in 2011. Boko Haram’s insurgency did start in 2011. There was the Boko Haram uprising in 2009 when they were brutally crushed by security forces and forced underground. They resurfaced in 2011 as a terror group. Thank you.